NOTE: before we begin, make sure that your host system has a functional Intel VT or AMD-V flag set. This is essential for creating Virtual Machines on your Host system. If you get a positive result for the above grep command, you are good to go. You will need at least 20-30GB of free HDD Space on your KVM Host. 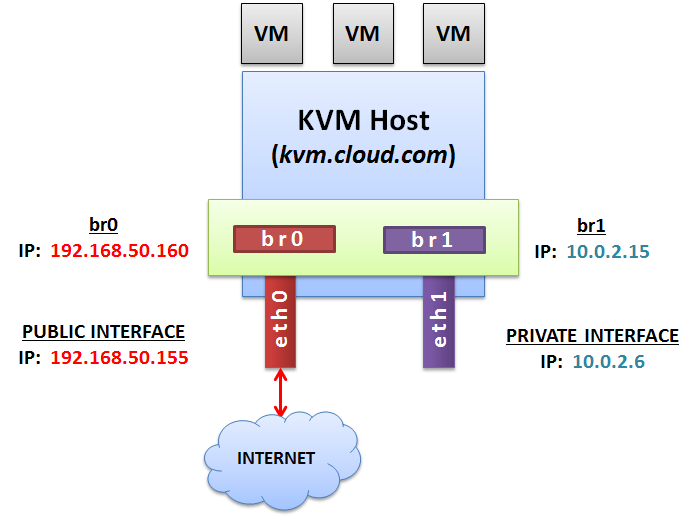 This will be used to by the VMs deployed on KVM. # yum groupinstall "Virtualisation Tools" "Virtualization Platform"
NOTE: If you get any errors at this stage then it means that something went wrong with your KVM installation. Kindly go back and check. DO NOT PROCEED without rectifying the errors at this point. Next, we install bridge-utils. This package contains utilities for configuring the Linux Ethernet bridge. The Linux Ethernet bridge can be used for connecting multiple Ethernet devices together. IMP: Now in my case, I will be designing the Network Bridge in such as way that the br0 (Bridge Interface connected to eth0) provides my VMs with Internet access and br1 (Bridge interface connected to eth1) provides the VMs internal access to all the other VMs connected on the LAN. Next, edit the /etc/sysconfig/network and add the GATEWAYDEV parameter as shown. In my case, I'm routing all my Internet based traffic via br0. Restart the Network. Make sure ou do not get any errors on the Interface. If you got it till this far then kudos!! You are now ready to create and launch your VMs!! 5 reasons why AWS rules! Copyright © 2012- 2016 Yohan Wadia. Powered by Blogger. This is a personal weblog. The opinions expressed here represent my own and not those of my employer. All data and information provided on this site is for informational purposes only.